Avoid unnecessary slow usage and Outlook crashes by making sure you are using Outllook as optimally as possible. It's the item count not the size that matters. Having a large number of items in a folder will mean that Outlook will open slower and any operations in that folder will take longer (so long that it may seem like Outlook has crashed since it seems frozen). Overall Outlook performance is largely influenced by the number of items in the heavily used folders. Inbox, Deleted Items and Sent Item folder are the primary folders where large amount of items will disrupt performance. Calendar, Contacts, and any other folder that is heavily used can also disrupt performance. The Microsoft Exchange Team recommends no more than about 2500-5000 items in any folder. If you have more than 5,000 items in your inbox, for example, you can have unpredictable results depending on how you use Outlook. 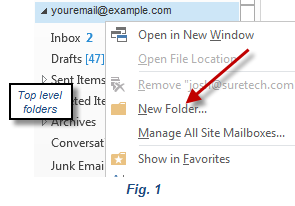 You can improve Outlook performance by creating new top level folders or sub-folders (See Fig. 1) and moving items from the heavily used folders into these new folders. Remember not only can you can create subfolders in the Inbox but you can also create subfolders in Sent Items and Deleted Items for better organization. If you are ever experiencing issues using Outlook on your local desktop, please use the Outlook Web App at https://webmail.suretech.com/. You can make make subfolders and move items around in the Outlook Web App which will update your local Outlook the next it is launched.